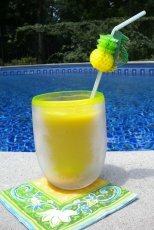 Wood patio umbrellas provide a classic look to any pool or outdoor area protecting you and your guests from the hot sun and harmful UV rays. The umbrella pole and umbrella ribs are finished with several coats of marine varnish that protects the wood and can give it a finished look for years. 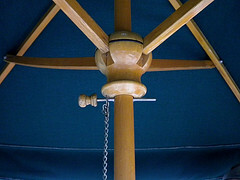 A wood patio umbrella consists of a wood pole and wood umbrella rib arms. They are made from different sources of wood such as the most common, less expensive Asian hardwood called Nyatoh to the most expensive which is teak. Another common wood that is used is eucalyptus. The umbrella poles can come in a natural finish or in a variety of stains. Most wood umbrella poles come in two pieces, although single solid poles are available. The single pole is more durable, but not as practical as the two piece poles for shipping and storing. Here you see a picture of how most wood umbrellas open and close. The pin inserted in a hole holds the umbrella canvas open. Remove the pin to close the ribs. This is our outdoor umbrella and we do like it, it's just that it is hard for me to reach the pin to open and close it. If you live in a windy area - this is important. The umbrella needs to be closed when not in use so that a gust of wind doesn't blow it out of it's stand or tip it over. Wind is the number one enemy of a wooden market umbrella. Although wood market umbrellas have a classier, more expensive look than an aluminum patio umbrella, they are not quite as practical.The wood ribs are sturdy, however they can't absorb strong gusts of wind like aluminum frames. The ribs can be replaced if they are broken. This is a picture of my daughter's wood patio umbrella. Several ribs cracked after a sudden gust of wind. 1. 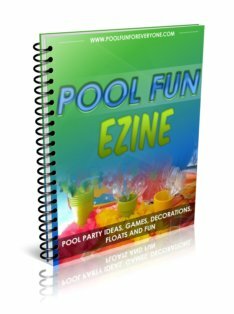 When possible take it down and store it if you know a storm is coming or at the end of your summer season. 2. 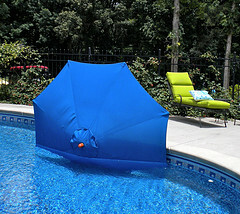 Simply closing the umbrella will help to prevent it from being lifted up out of it's base during a strong wind gust. Some umbrellas have ties to secure it even more. 3. Use the appropriate weighted umbrella base for the size of your umbrella. Our umbrella base was too light for our umbrella because it was free standing and not going through a table. 4. After a rain, open up the umbrella canvas to dry off the umbrella and wipe down the wood pole with a dry cloth to get the water off. 5. Periodically, apply marine varnish to the wood frame to protect it from fading and discoloring. As you can see in order to open or close your umbrella you must insert or remove the pin - which is at the top of the umbrella. 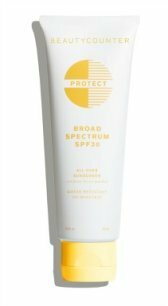 So for you tall people that might work great. 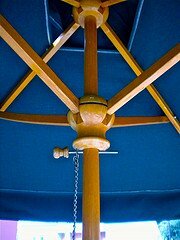 For a long time you could only get the wood umbrellas with a push up or pulley and pin lift mechanisms. However, for those of you like me, who like the crank lift with a tilt option, this is now available with the wood market umbrellas at some patio umbrella stores. The most common sizes are a 9' or 11' umbrella. Wood umbrellas are a classic looking outdoor umbrella that offers shade and style to your outdoor dining or seating area. Although the wood ribs are sturdy, they can't absorb strong gusts of wind. However, ribs can be replaced or repaired if they are broken. My daughter and my neighbor both have wood patio table umbrellas and both have cracked their umbrella frame and/or ribs. We bought our first wooden umbrella this spring, because I couldn't resist the price - under $50. Within the first month one of the ribs cracked, of course my daughter hauled it to her house on her golf cart - so that may explain it :). We repaired the rib by using wood glue and then temporarily taping the rib with metal tape. After several hours we removed the tape and the patio umbrella looks like new. The wood framed market umbrella will also have wood ribs, which are not as flexible, and wind resistant as the fiberglass ribs. 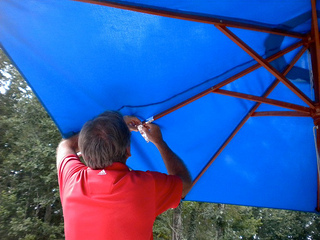 Aluminum and wood are the two most common types of material used for a patio umbrella frame. So if you decide you like the wood umbrella frame the best, be sure to close the umbrella and tie the strings when not in use so that a sudden gust of wind doesn't cause damage to your patio umbrella. The aluminum poles now often have fiberglass ribs to make them more wind resistant. Wood market umbrellas have a classier, more expensive look than an aluminum patio umbrella, but they are not quite as practical.